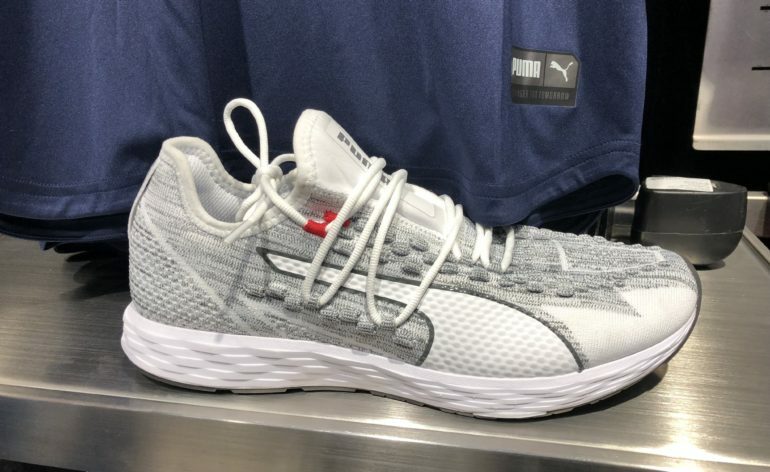 It started with Puma being FAAS when they introduced the range which goes from 100 to 1000 beginning with the most flexible and least cushioned to the most cushioned, which also results in reduced flexibility in the rear of the shoe. My favourite was the Faas 100, a highly flexible shoe that commenced at 6mm drop. This also saw the birth of the Faas 300 which was similar, but had a greater curve last with a cut out for the medial arch. The shoe was slightly more ‘stacked’ (amount of cushion depth in the midsole) and the drop from heel to forefoot was 8mm. This drop is important because in a natural foot strike (ie what we would naturally do if we were not wearing shoes) the first contact tends to be on, or just behind, the ball of the foot. The exact spot is determined by mechanics, flexibility (altered by life style), and speed of current movement, amongst other things. However the angle of contact is such that generally the heel will ‘kiss’ the ground immediately after the initial contact. If the drop from forefoot to heel of a shoe is greater than about 11 mm then the heel of the shoe will tend to hit the ground first and so the style of running is forced into a heel toe action. The runners is then ‘blocking / braking’ the natural motion. We naturally heel strike when trying to stop from a run, and this is achieved by putting our foot out in front of the bodies centre of gravity. This puts considerable stress into the front of our legs and into knee and hip joints. So most of the Faas series are less than 10mm drops. The range then turned from being called Faas to Speed. The basics is that we look for cushioning for distance, but want a ‘firmer’ feel of the ground when doing quality work or racing short distances. This is primarily due to the fact that we develop our running power by the amount of ‘push’ we can direct into the ground as we push backwards which in turn drives our body forward. So the previous version of the Speed 300 had a mid sole of eva and ignite but in separate layers. It was at this time that Puma introduced the ‘Netfit’ innovation. In effect they developed a one piece/ sock upper over which they put hexagonal netting. Instead of having a normal lacing yoke, the lacing at the front commenced above the mid foot, but then was carried in the netting to the top. The tongue of the shoe was part of the upper and so this allowed runners to lace the shoe wide over the foot to cater for narrow feet or close to cater for wide feet. The fact that the netting covered the whole of the upper meant runners could totally customise their lacing to provide differences in tightness or relaxed fit to fit their feet and feel. 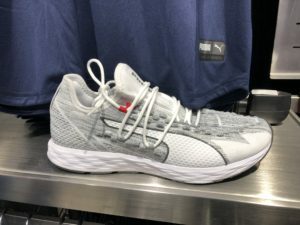 The latest shoe has taken the next evolution: It is a lightweight shoe with the 8mm drop but now has a 15mm mid-foot stack (23mm heel stack) which now mixes the ignite and Eva in a single material. This provides a firmer feel as racer, but is still gives a level of energy return. There is a full length hard wearing outer sole, and in the forefoot a propulsion / flex plate is located between the outer and the midsole. This is anchored below the rear of the midsole. This plate allows flexibility through the shank of the shoe, but inevitably adds increasing stiffness going towards the heel. The concept of the Pro Plate is that when the runner lands on the plate in the midfoot of the shoe it is flexed and so puts energy into the plate: this plate then tries to return to its normal status and as such returns energy into the foot. Because the puma plate is anchored further back in the shoe, it seems to be more effective. However it is important to note that each runner will need to find their own sweet spot of landing to ‘activate’ that feel of propulsion, so it is something that is gained with time. The other obvious difference in the latest 300 is the new version of lacing and the sock type upper. This is extremely comfortable and with virtually no seems the shoe could almost be worn without running socks. Personally the fit of the upper was almost perfect without the use of laces. The last on the 300 is now slightly straighter which for many will provide more support and less torsion under the medial arch. This gives the shoe even greater versatility of distance and opens its use to the full marathon distance, whereas the previous versions tended to top out around 15km with lighter runners taking it to 21km.